Scavenger’s Season by Kit Kelen, published by Puncher & Wattmann, was launched by Jean Kent at The Press Book Club, Newcastle on 18th December 2014. 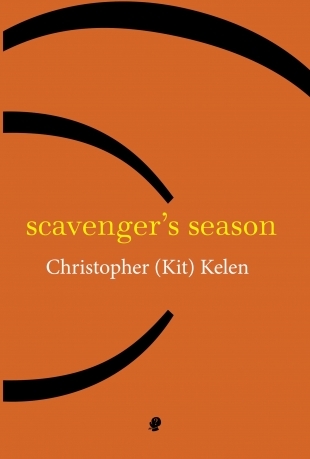 It is a very special pleasure tonight to introduce you to Kit Kelen’s new collection of poems, Scavenger’s Season, published by Puncher & Wattmann. Over the last year, one of Kit’s projects was the production of an anthology of poetry from Newcastle and the Hunter region, which he invited me to co-edit. The book we assembled, A Slow Combusting Hymn, is an abundant celebration of both the best current poetry in this region and the region itself. It is, as Kit describes it in the cover flap, a ‘book of words for and from a place’. It is a book of ‘experience of somewhere’ – and that somewhere is the place ‘most of the poets in its pages call home’. Now, in Scavenger’s Season, we have another celebration: an abundant twenty-five years worth of poems, and at the heart of all this writing, Kit’s love of the place he calls home. In Kit’s poems, we are treated to a sensibility tuned to the wonders of the world. He celebrates so many ‘small things’ in the landscape – wings and grasses, fences and creeks – and even the way a human might need to ‘puzzle a way in my limbs / as roos do’ in order to follow, or pause, on a track … There is a sense of not only the words but the whole human being behind the words being immersed within beautifully lived-in moments. The world in this book is full of potential and good things. Some of them are very simple, and sensual. In ‘mulberry hill of plantings’, I love the utter charm of his description as a stick is planted and thoughts seep through the poem of purple fruit for tarts and birds drunk on the fermenting fruit. So few words are used, but all the stained mulberry fingers and lips of childhood seem to be there, along with the adult uncertainty of what will come from these cuttings. We, too, can hear the birds in these poems – kookaburras, a frog mouth, white cockatoos, black cockies … even the voices of flies and ants and the speech of “hoof and snout and paw”. There is much plundering of poetry through the ages, but in a good way – with reverence in the references. You don’t need to know all the poems that hum in Kit’s brain to appreciate his own writing, but it does add another layer of delight to recognize the little riffs here and there, from centuries of literature from around the world, which have obviously pleased him. Most importantly, though, what comes through in this book is a voice that is distinctive and original. Kit’s style is very much his own. Reading these poems, you may have to stop and learn a new way of letting the English language surprise you. But the surprise will be worth the pause, because this book offers us the chance to hear words as if they’ve become new again, as if they can be mysterious, as they make what they’re describing fresh and wondrous. This is what happens in Scavenger’s Season, over and over again … Words are Kit’s work and his play, and he plays and works with them with an uncanny blend of skill, intuition and serendipity. Sometimes the result is a multi-layered tour de force like ‘for the bears, a leg-up’ or ‘The Shed’, where page after page carries on in a mesmerising engagement with humour and lyricism, rhetoric and laconic throwaways. There are puzzles in this book as well as sensory delights. There are marvels and meditations. There are ‘blokes’ and ‘yokels’, cows and wrens; there is a poet who is both a meditator in his hideaway and a tender of land who needs to keep an eye out for the young snake in a boot and the threat of bush fires, as well as wondrous images for his writing. In Scavenger’s Season, he has followed his own advice and made us a book brimming with homage and celebration. I found it intensely rewarding and moving and I feel honoured to be recommending it to you. Jean Kent has published four full-length collections of poetry. A new collection, The Hour of Silvered Mullet, is forthcoming from Pitt Street Poetry in March 2015. This entry was posted in Issue 13, Jean Kent, Kit Kelen, Puncher & Wattmann, Scavenger’s Season by Mark Roberts. Bookmark the permalink.